Home / Products / Chocolate / Hot Chocolate / Are You Hot for Chocolate? Are You Hot for Chocolate? 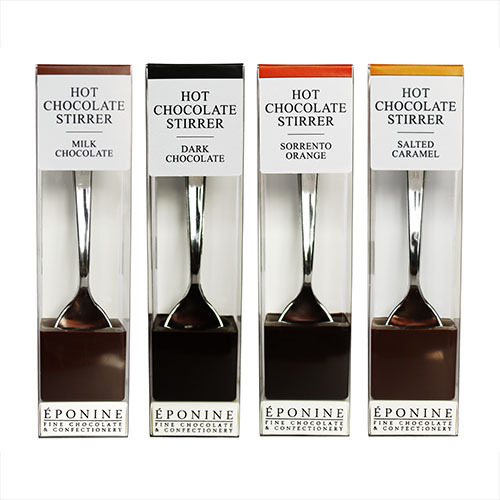 We’re so happy to share with you our new range of hot chocolate stirrers! Our hot chocolate stirrers have been a huge hit since we first launched them, and they are now better than ever. The new range features 4 of our most popular flavours in new sleek packaging, which you can see below. Milk Chocolate – Our own blend luxury milk chocolate with a very high cocoa, specifically created to produce a delicious drink with the sweet creaminess of milk chocolate. Dark Chocolate – For those who enjoy the richness of dark chocolate, this dark chocolate stirrer is a perfect choice. It’s also suitable for vegans – try it with hazelnut or coconut milk! Salted Caramel – A high cocoa milk chocolate made with caramelised sugar and sea salt, to create a very moreish hot chocolate with a sweet caramel flavour. Sorrento Orange – A classic combination of rich chocolate and the fragrant essential oil of Sorrento oranges. It’s also vegan friendly – try it with almond milk! These four classic flavours are already available in our Online Boutique. Hot chocolate fans can also look forward to more exciting new flavours coming soon!